Teacher Appreciation Week occurs on the first full week of May in the United States. Teacher Appreciation Day, also known as National Teacher Day, is on Tuesday, May 4, 2010. Outside the U.S., many other country celebrate Teacher Appreciation every October 5 on World Teachers Day. According to Wikipedia, the state of Massachusetts adopted September 11 as Teachers' Day back in 1976, and still sets the first Sunday of June as its own Teachers’ Day. However, the National Education Association and the National PTA recognize Teacher Appreciation Week as the first full week of May, annually. Typical Teacher Appreciation Day gift ideas from school staff or administration may include gift certificates, lunch, and gift baskets. If your faculty has a teacher appreciation ceremony, this is a great opportunity to have a few laughs along side the recognition. 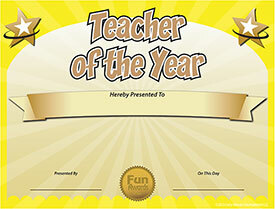 Download our funny teacher awards and put a smile on everyone's face. Remember to bookmark this site and check back regularly for ideas for teacher appreciation week, teacher appreciation day gifts, teacher appreciation week e-cards, and printable teacher appreciation certificates. We'll also give plenty of advice on how to host an unforgettable teacher appreciation event, teacher appreciation party, or teacher appreciation banquet. When is Teacher Appreciation Week 2011? Remember to mark the first full week of May 2011 on your calendar for Teacher Appreciation Week 2011, and May 3, 2011 for National Teacher Appreciation Day 2011.